2018 is here and it’s the time of year where people set new intentions and kickstart some of their goals. Many people have “weightloss” as one of their resolutions. Instead of focusing on just losing weight try to take a new approach to overall wellness. Below are a few of our favorite black owned fitness companies to help get you started. Check them out and tell them we sent you! What is it? Trap Aerobics. You read that right, Grillz and Granola is a class that combines dance and aerobics with a dope soundtrack (think Cardi B, Migos, etc.). Led by two NYC natives, Fiona and Chavonne, Grllz and Granola not only offers fitness but also hosts several events that tackle overall health including mental health, nutrition and self-love. S+E even had an opportunity to partner with the company last year and we can’t wait to see what the future holds for them. 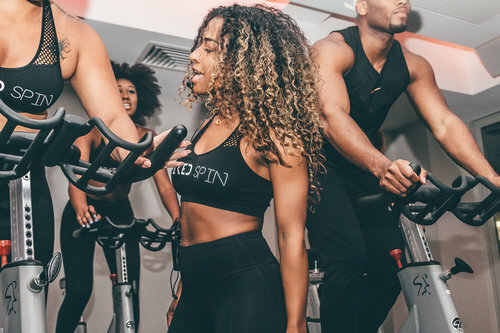 Spin classes are known to be awesome cardio that leaves you drenched in sweat, however sometimes the atmosphere and music can be less than desirable and that’s where Spiked Spin comes in. Created by Briana Ownes, the class is set to current hip-hop music and instructors curate a list that keeps you hype for the duration of the ride. The atmosphere is welcoming and fun with lowlights that give a cool vibe versus the sterile gym club feel. Goodwrk is a training collective created by trainer Percell Dugger (the one guy that made it into this list, give us a break). Specializing in small group fitness Goodwrk offers challenging workouts that push you beyond your comfort zone and show you just how strong you are. The workouts include cardio and strength training, and since it’s small Percell is able to give each member a unique experience.